Synthetic peptide conjugated to KLH derived from within residues 1150 - 1250 of Fruit fly (Drosophila melanogaster) Dscam. 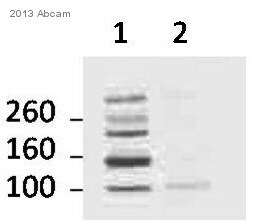 This antibody gave a positive signal in Drosophila S2 cell lysate. Our Abpromise guarantee covers the use of ab43847 in the following tested applications. WB Use a concentration of 1 µg/ml. Predicted molecular weight: 222 kDa. Publishing research using ab43847? Please let us know so that we can cite the reference in this datasheet.